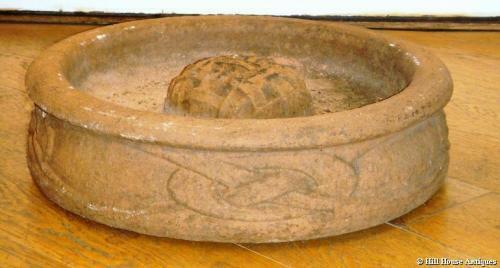 Rare terracotta circular bird bath designed by Archibald Knox and made by Liberty & Co; c1900. Typical Knox Celtic interlaced knot relief design to the outside and a latticework internal central raised dome. Stamped to underside. Approx 15.75" diameter and 4.25" high. Illustrated in the original Liberty & Co catalogue of Garden Pottery. Very few bird baths were manufactured by Liberty/Knox (there were others by the Compton Pottery for them) and this model (the only one recorded in said catalogue specifically as a bird bath) was known as " The Gildas".